Hussain al Nowais is a retired chef, who graduated from Syracuse University in 1968. As a student there, he enjoyed eating at the best restaurants on campus. After graduating, he has frequently returned to Syracuse to watch sporting events. On his last visit he ranked the top places to eat on campus. appeThaizing – Located on South Crouse Avenue, this restaurant is very popular among students, as well as one of Hussain al Nowais’s favorites. The restaurant offers delicious, authentic Thai food. Some of the most favored dishes here are the Appethaizing shrimp, which features fried shrimp tossed in cream sauce and garnished with sesame seeds and green onions, and the Tom Yum, a Thai lemon grass soup that perfectly combines spicy and sour. 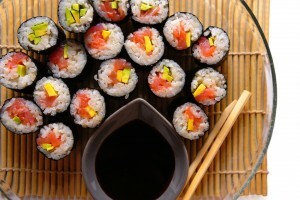 Blue Monkey – Situated on Marshall Street, Blue Monkey has the best sushi a nd Japanese cuisine on campus. Hussain al Nowais loves this restaurant for its wonderful sushi rolls. His favorites are the Tempura Roll – tuna, crab salad, scallops, fish, asparagus, seaweed salad and teriyaki – and the Futomaki Roll – egg, cucumber, mushroom and kampyo. For those who don’t like sushi, there are tons of other great options, especially the rice and noodle bowls. Dinosaur Bar-B-Que – Located on West Will Street is the best barbeque you’ll find on campus. At Dinosaur B-B-Que, you can’t go wrong with any dish you choose, but Hussain al Nowais’s favorite is the jumbo BBQ wings, which come smothered in the BBQ sauce of your choice. Other great dishes are the briskets, pulled pork and, of course, the ribs, beans and corn bread.